This paper develops a new method for uncalibrated image-based visual servoing. In contrast to traditional image-based visual servo, the proposed solution does not require a known value of camera focal length for the computation of the image Jacobian. Instead, it is estimated at run time from the observation of the tracked target. The technique is shown to outperform classical visual servoing schemes in situations with noisy calibration parameters and for unexpected changes in the camera zoom. The method’s performance is demonstrated both in simulation experiments and in a ROS implementation of a quadrotor servoing task. The developed solution is tightly integrated with ROS and is made available as part of the IRI ROS stack. 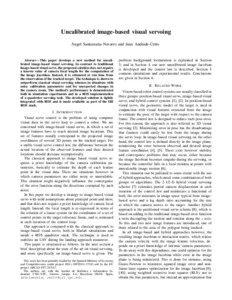 Santamaria, A.; Andrade-Cetto, J. Uncalibrated image-based visual servoing. A: IEEE International Conference on Robotics and Automation. "The proceedings of the 2013 IEEE International Conference on Robotics and Automation". Karlsruhe: 2013, p. 5247-5252.